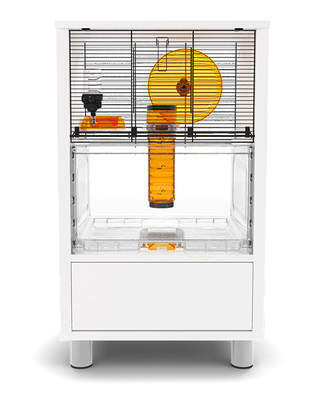 How Do I Clean My Hamster's Cage? 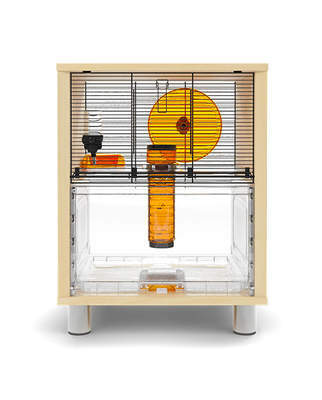 This depends on which hamster cage you own - for example, if you’ve opted for a modern hamster cage such as the Qute, then this can be done simply in a couple of minutes. Older cages may be trickier and take longer to clean. 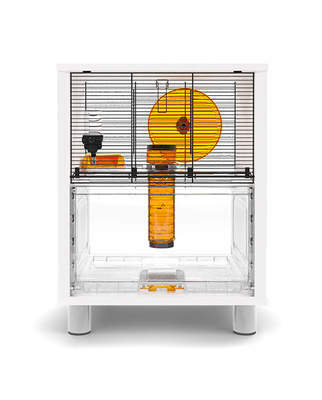 Below we’ve included some suggestions on how you would go about cleaning the different models of hamster cage available. 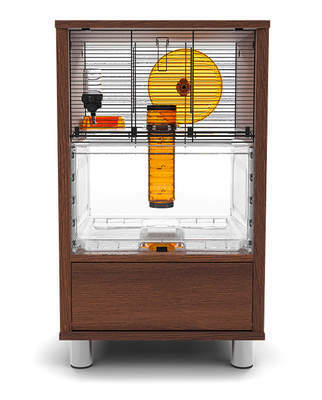 The Qute is a modern alternative to the traditional hamster cage. It’s been specially designed to make cleaning out a cinch - the top part of the enclosure is made of horizontal bars, so that any droppings will fall straight through into the removable bedding tray. 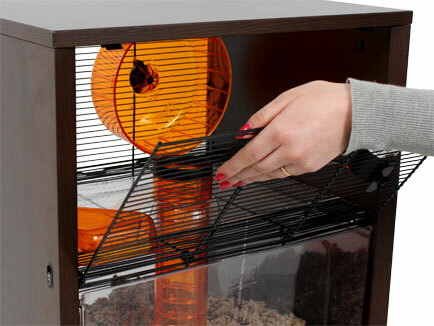 To clean the Qute, all you need to do is usher your hamster up the tube so that it’s in the top part of the enclosure. Then, push the tube up so that your pet can’t scurry back down. Next, slide out the bedding tray and tip it into your compost bin. Spray it with a disinfectant, give it a wipe, and refill it with fresh bedding. Then simply pop the bedding tray back into the Qute and bring the tube back down to the original position. Clean the accessories, and you’re finished! There are dozens of different traditional cages available, but regardless of the specific one you have, the stages will be roughly the same. The first thing to do will be to take your hamster out of its cage and keep it somewhere safe. You could place it gently into a spare enclosure or, if you’ll be less than twenty minutes, its exercise ball (and entrust it to an adult). If you opt for a spare enclosure, then be sure to give it a bit of bedding, food and water. When creating a spare, temporary enclosure it's good to be aware that cardboard boxes are very easily gnawed through. Next, you’ll need to take out all the accessories, including the food bowl. These will be cleaned later, but you may prefer to remove the bedding before you do so - depending on what type you use, this will either involve tipping the material out into a bin, or using the base lining to lift it up and out of the cage. Once the cage is empty, give it a wash with a special spray and a cloth. Each time you clean the cage, you'll either want to use a freshly cleaned cloth or a new one. Many owners have a special 'hamster cage' cloth that they disinfect and wash between cage cleans. With this cloth, make sure that any bits of waste or bedding that have gotten stuck are removed, and that the cage is well-scrubbed. If your cage has bars on it, then you’ll need to give these a good clean as well. Cleaning all the cage will get rid of all the waste that has collected there, and will create a much nicer environment for your pet. You’ll also need to clean all those accessories that you removed earlier - they need to be scrubbed as well as the cage to clean them of waste. Your hamster clambers all over these things so you’ll want them to be as clean as can be. Hamsters lick and nibble their accessories all the time and you don't want them ingesting anything bad. After the cage and the accessories have been cleaned, you’ll need to let everything dry off for a few minutes before refilling the cage with the bedding, as the bedding will get wet and soggy if it’s put into a moist cage. Hamsters can catch chills from contact with damp bedding, so it’s best to wait until it’s dry, then to refill the cage with bedding and put back all the clean accessories. The last things to do are to clean your hamster’s food bowl, clean your hamster’s water bottle, and then finally to refill them both and return them to their original places in the cage. If they aren’t cleaned regularly, then dirt can build up in both of them, and the bottle in particular can develop problems. Hamster water bottles can become blocked, preventing your hamster from having access to moisture. Now that everything is nice and tidy, you can put your hamster back in its cage. 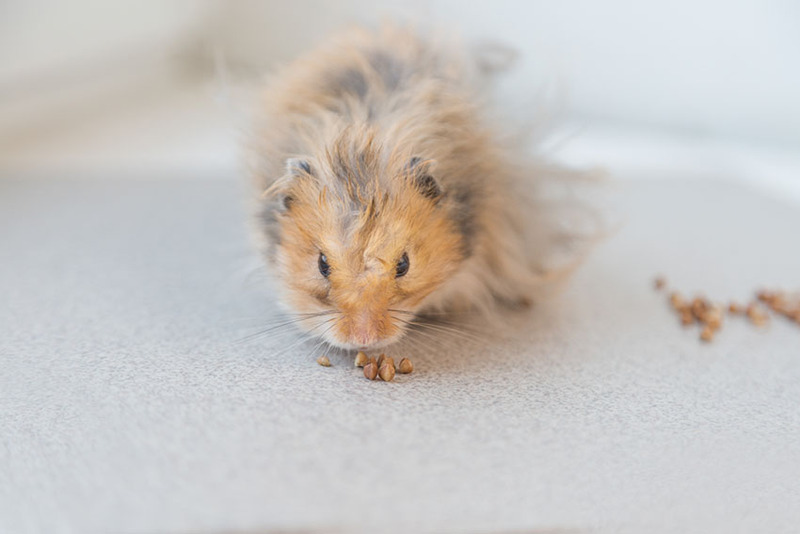 Some owners feel that their hamster is more comfortable if a little bit of soiled bedding is put back in with the clean bedding, so that some of the cage still has some of your hamster’s own scent in it. You might want to try this, but in any case, your hamster will thank you for its lovely, clean home. Let your hamster get used to its freshly cleaned enclosure for a while rather than picking it up again too quickly.